The manta ray is one of the largest fish in the ocean, with a wingspan of up to twenty feet (six meters). 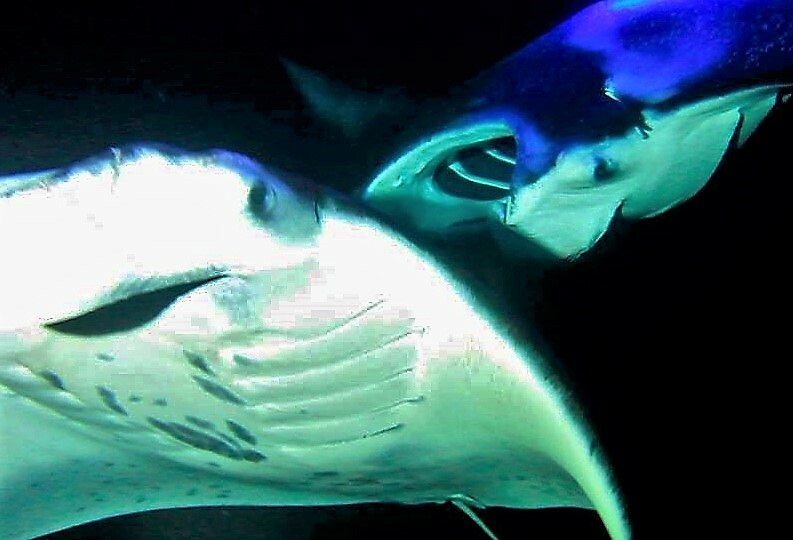 Closely related to sharks, manta rays are friendly. They do not feed on the flesh of large animals, nor do they have a stinger. Instead, their primary food source is tiny zooplankton that they filter from the water through structures in their gills called "gill rakers". A manta must be in constant motion to keep water flowing over its gills. Mantas prefer warm, tropical waters like those found in Hawaii. Slightly smaller than their larger Oceanic Manta cousins, the species of manta most commonly found in Hawaii is called the Reef Manta. The resident Reef Mantas tend to stay close to shore near the coral reef. With an abundance of these reefs nearby, a large population of Reef Mantas thrives in the waters off the Big Island. In fact the Kona Coast is the best place in Hawaii to view these amazing creatures. Since the reef manta doesn't migrate, manta viewing is available throughout the year. We often spot them gliding along the offshore reef during the day. For the absolute best viewing, sign up for a manta ray night snorkel tour. Just after sunset, spotlights illuminate the water in specific areas where mantas are known to feed. Tiny plankton are drawn to the lights, thereby attracting the mantas that feed on the plankton. Under the lights, the mantas put on quite a show, dancing and gliding effortlessly through the water, mouths agape as they feed. Prepare to be amazed as these majestic creatures pass right under your own nose. Enjoy a Big Island sunset as your boat cruises from the Honokohau Marina, 20-30 minutes along the Kona Coast to the snorkeling site. $95 includes all equipment plus snacks and beverages for the 2.5 hour tour. Option to ride along and view mantas from the boat for only $47. Canoe from Keauhou Bay and paddle out about five minutes to the manta site. Enjoy a Hawaii sunset from the comfort of your canoe, then slide into the water when the mantas arrive. Approximately 2 hours for $99, including cookies and hot chocolate. 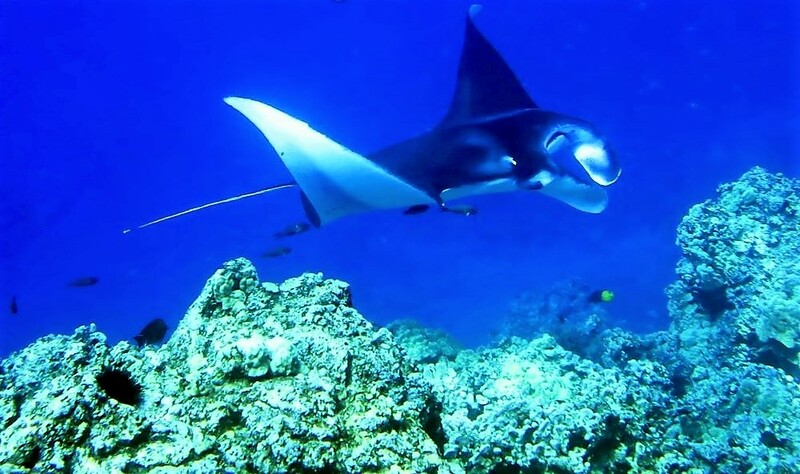 Travel just five minutes from the marina on Keauhou Bay to the manta snorkeling site. For those with time constraints, this tour is a bit shorter at around 90 minutes. $138 includes hot soup, drinks and all necessary equipment. For guests staying in Waikoloa and points north, it might be more convenient to join the manta night snorkel in Puako. This 2.5 hour tour departs just prior to sunset from the Puako boat ramp. After a leisurely boat ride, the group swims/snorkels a short distance to the viewing area. All equipment, light snacks and beverages for $119. For divers, there's nothing quite like sitting on the bottom of the ocean while giant reef mantas swim around you! This is one of the top night dives in the world. Divers gather late afternoon at Honokohau Marina, then enjoy a leisurely sunset boat ride to the dive site. Full tour lasts approximately 3.5 hours.